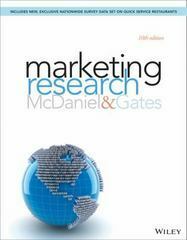 Marketing Research 10 Edition In Marketing Research, 10th Edition, authors Carl McDaniel and Roger Gates share their industry experience to teach students how to make critical business decisions through the study of market research. Designed for marketing research courses, the authors' practical, applications-based approach features Real Data, Real People, and Real Research, to prepare students to conduct and use market research for future careers in business. Co-author Roger Gates, President of DSS Research, infuses the text with a practitioner perspective, helping students learn how to use marketing research through a practical presentation of theory and practice. WileyPLUS Learning Space is an easy way for students to learn, collaborate, and grow. With WileyPLUS Learning Space, students create a personalized study plan, assess progress along the way, and make deeper connections as they interact with the course material and each other. This collaborative learning environment provides immediate insight into strengths and problem areas through a combination of dynamic course materials and visual reports so that you can act on what’s most important. *Access to WileyPLUS Learning Space is sold separately.